Get your All Occasion Value - Boxed Cards-50 Cards at discount, wholesale, cheap. Two each of the following designs. All with Scripture! 9 Birthday cards including 1 Child Birthday. 3 Sympathy Cards. 3 Get Well Cards. 1 Encouragement Card. 1 Wedding Card. 1 Anniversary Card. 2 Blank Cards. 2 Baby Cards. 2 Thinking of You Cards. 1 Thank You Card. From Christion Inspiration Greeting Cards. 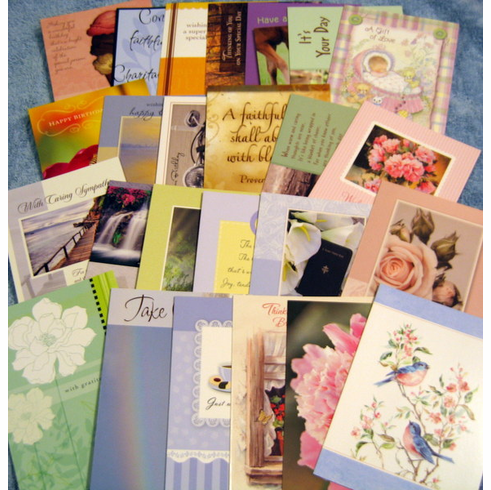 Get your All Occasion Value - Boxed Cards-50 Cards at discount, wholesale, sale priced, inexpensive and even cheap.